The streets of Florence—epicenter of Renaissance art and culture—are living history for scholars and art lovers alike. 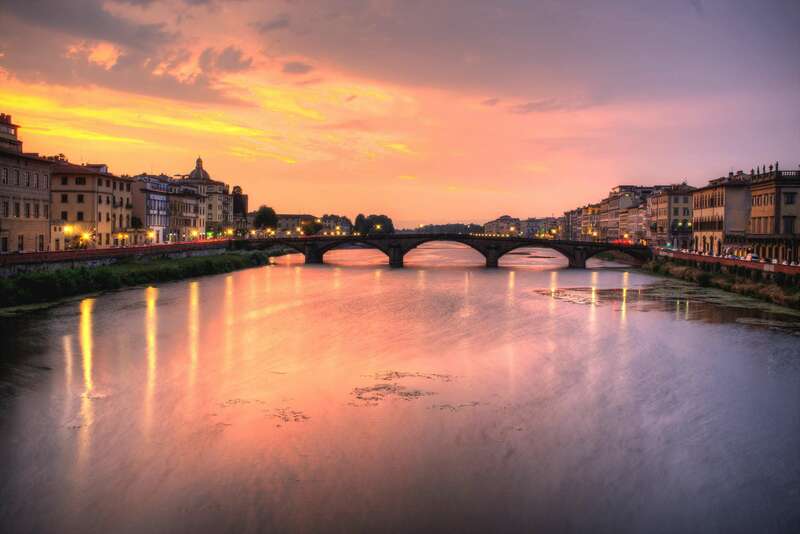 Charming and historic, Florence offers a rare opportunity to step back in time. Its 15th- and 16th-century monuments, buildings, and churches—including, most famously, the Duomo—and its many artworks, such as Michelangelo's Statue of David, highlight why this small Italian city is considered the birthplace of the Renaissance. Under the Medici family, who ruled during this era, the worlds of art, architecture, science, and humanism flourished, and the remnants of this explosively creative time are still visible today. Florence has also retained its other traditions—crafts and food—with current Florentine leatherworkers, silversmiths, shoemakers, and milliners producing artisanal goods, and cafes, markets, and restaurants preparing the city's celebrated cuisine. Explore iconic Florence with Context's private and semi-private guided tours. With over 30 experts in our network in Florence, we offer a wide range of experiences, from private and semi-private guided tours of the major monuments to hands-on activities for kids. One of our most popular guided tours is our introductory Florence Night Tour, a passeggiata—the Italian ritual of an evening stroll—that visits the Duomo and critical sites in the center of the city in the warm light of early evening. Among the most renowned museums in Italy, our private and semi-private tours of Florence enable us to weave through the crowds, allowing for more close inspection with our expert guides. Join our Uffizi Gallery Tour and discover the greatest works of the Renaissance with an art historian. Or, are you hankering to see Michelangelo's Statue of David? Do it with a real expert on our Accademia Gallery Tour, which examines the greater narrative of Michelangelo's life before taking in his masterpiece, David. By now we're getting hungry, which is why we offer a Florence Food Tour that uncovers (and tastes) some of the best wine, cheese, and gelato in the world. Florence may be riddled with tourist traps but, on this tour, we sniff out some of the local favorites that still remain. We also offer a range of private tours for kids in Florence, including our Uffizi Tour for Kids and a Florence for Kids scavenger hunt tour. All of our family guides are trained in Visual Thinking Strategies, enabling them to present complex and historical information in a fun, relatable, and interactive way.